The Cedar Rapids Metro Y is the leader in offering sports and programs for kids of all ages and abilities on a year-round basis. For nearly 150 years, our YMCA has been helping kids grow into confident and successful adults. At the YMCA, everybody plays and everybody is a winner! With the emphasis on participation, each child plays, regardless of size or ability. As a result, youth learn good sportsmanship, teamwork, build self-esteem and have a great time! The YMCA offers a variety of Youth Sports, from Mighty Mites (for youths ages 3-5), to cheerleading, volleyball and soccer, track, basketball and flag football. YMCA Youth Sports is also a GREAT way to get involved with kids in our community. We are always looking for good people to coach and referee. You can help us make a difference in kid’s lives. Soccer for kids is exciting – a sport combining team play and individual skills. We offer instruction for 4-5 year olds and separate kids’ soccer leagues: AK/K to 5th grade for girls; AK/K to 5th grade for boys. The Y knows all about basketball…considering we invented the game! (Yep, it’s true…look it up). 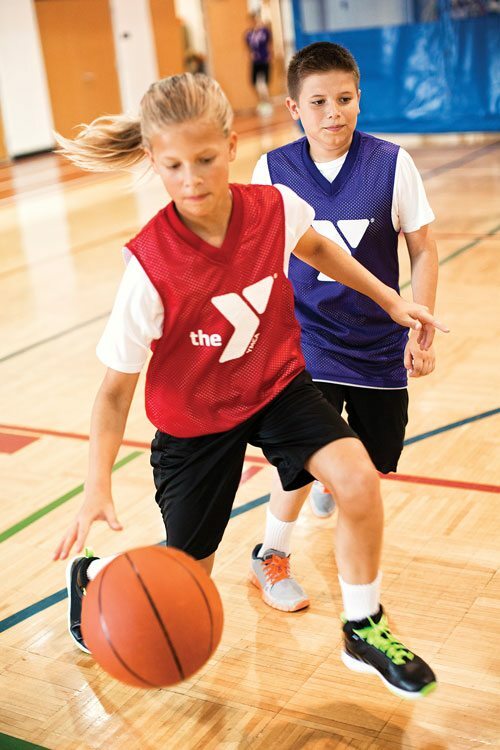 The Y offers Youth Basketball for boys and girls of varied ages. Combining gymnastics, tumbling, cardio and dance, cheerleading has evolved from a sideline activity into a full-fledged sport! Y cheering includes practices and cheering at Y Youth Basketball games. Playing, learning and having fun is what Y sports is all about! We offer programs for kids from 4 years old to 2nd grade, dividing kids according to age. Mighty Mites and T-Ball are Co-ed, Baseball and Softball leagues are not. Both the Adventure Guides and Adventure Expeditions programs focus on the parent’s roll in the lives of their children including building confidence, forming bonds, and creating lifelong memories. Kids ages 7-14 can participate in Zumba Kids at the Marion Y. Please register before attending. The class is FREE to members; nonmembers can pay to participate. For updated schedules, please look for “Group Fitness” in the Program Guide, or check our online schedule. Grab your shoes and join us to run for fun! Kids in Kindergarten through 6th grade will learn the basics through Tuesday practices and Saturday track meets. We run two Volleyball Leagues for approximately 7 weeks, one in the spring and one in the fall, for 3rd – 6th graders. For dates and times, check our program guide. This self-defense based martial art, taught by Josh Meredith (3rd Degree), applies rules and principles of motion in a system of forms, sets and techniques. The class teaches confidence, flexibility, conditioning and health. Session dates run monthly. Register by the FIRST of each month, 16 and older only. Community members must purchase a punch card.